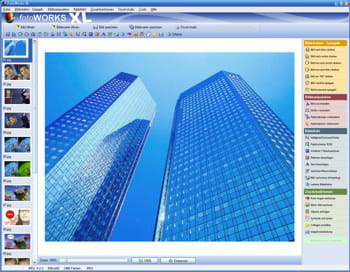 FotoWorks XL is an image editor for digital images. By MEDIAKG, it has a simple interface enabling users to enhance their photos in record time. Professional and amateur users can both use it. Image retouching: FotoWorks XL is an image retouching program for image optimization. It integrates all the necessary tools to perform a quick photo retouching. It is able to work batch process images, which accelerates the process. Photo editing: an example of picture enhancement is FotoWorks XL’s ability to adjust the brightness and contrast, color balance, rotate, fix red-eye and more. Effects: FotoWorks XL provides its users with a compendium of effects for easy customization of image including, among others, sepia effect, blur, movement, mosaics, etc. Compatibility: this software can also convert images from one format to another, and create custom presentations. For this, FotoWorks XL supports the common picture formats like BMP, GIF, TIF, TIFF, JPG, JPE, and others. Operating Systems: Windows 98, Windows Me, Windows 2000, Windows XP, Windows Vista, Windows 7, Windows 8. FotoWorks XL is easy to handle and master. Its interface is user-friendly, graphical and intuitive. Latest update on August 27, 2013 at 08:51 AM.